What is the TGA doing about metal-on-metal implants? Metal-on-metal (MoM) hip implants (in which the articulating surfaces of the implant are made from metal) have been used for many years in Australia but their use is declining. The relative performance of all hip implants has been actively monitored by the TGA since the inception of the National Joint Replacement Registry (NJRR) in 1999. The data from the NJRR show that there are MoM implants that perform just as well as other types of hip implants. MoM hip implants are used in some total conventional hip replacements, in which the femoral head is totally replaced by the implant, and in almost all total resurfacing hip replacements, in which a metal cap is placed over the femoral head (i.e. the femoral head is only "capped" or "resurfaced"). MoM hip implants that have been found to require early replacement are mainly those implants used in conventional total hip replacements with a larger size of femoral head, and implants with small femoral heads used in the resurfacing hip replacement procedure. This emerging knowledge has changed surgical practice, with surgeons now better able to tailor the choice of implant to the needs of individual patients. The true incidence and nature of adverse health outcomes due to release of metal (chromium and cobalt) ions and particles from these implants has not yet been established. At this time, there is insufficient evidence to conclusively demonstrate that MoM hip implants produce side effects beyond those that may occur at the site of implantation. However, metal ions have been reported to be associated with effects on the heart, nervous system, endocrine system and skin. There are differing opinions internationally about whether follow-up of patients with MoM hip implants should include regular blood testing for cobalt and chromium ions. There is no consensus on what might be the significance of particular levels of these ions in a patient's blood. However, there is some evidencethat consistently rising blood levels of cobalt or chromium ions over time could provide an indication that a MoM hip implant is starting to fail. On balance, the TGA recommends that patients with MoM implants be followed up regularly and that, in addition to soft tissue imaging such as ultrasound and/or MRI, the follow-up include blood tests for cobalt and chromium. Patients who have concerns about their hip replacement should seek advice from their orthopaedic surgeon and/or general practitioner. Following the worldwide withdrawal from the market of the DePuy ASR hip implants, there have been several reports in relation to concerns with MoM hip replacement implants more generally. These relate to whether the implants release trace amounts of cobalt and chromium and while all implants have a limited life in the human body and may need to be replaced at some point, there are also concerns that some metal on metal implants may need to be replaced sooner. Information about the DePuy ASR implants can be found on the TGA website. The purpose of this paper is to provide information for general practitioners, orthopaedic surgeons, other health professionals and patients who have undergone hip replacement with any MoM implant, including ASR. Advice to the TGA from the Australian Orthopaedic Association (AOA) and the Orthopaedic Expert Working Group (OEWG) is that MoM hip implants may be suitable for some patients who require hip replacement. In the case where a resurfacing operation is indicated there are currently very limited alternatives to a MoM implant. The TGA is continuing to monitor the performance of MoM hip implants as well as reviewing the clinical and scientific literature relating to this type of implant. On the basis of current information, the TGA considers that patients who have received a MoM hip implant require different follow-up from that which is normally required by patients with other types of hip implant. What is a metal-on-metal hip replacement implant? Hip replacement implants are designed to replace hip joints that have degenerated and become painful or (less commonly) were deformed at birth or damaged during an accident. The implants replace the painful, deformed or damaged "ball and socket" joint of the hip with components made of metal, plastic or ceramic. The "ball" part of the joint is called the femoral head, and the "socket" part of the joint is called the acetabulum, or acetabular cup. Some hip implants comprise a femoral head component made from a metal alloy containing cobalt and chromium that moves inside a metal acetabular cup or cup liner component. Such implants are commonly known as "metal-on-metal" hip replacements. 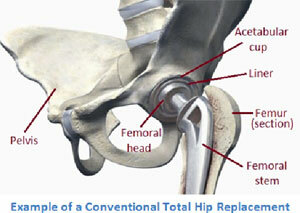 There are several types of hip replacement, but the two types of hip replacement surgery in which MoM components have been widely used are conventional total hip replacement where all the bone of the femoral head is replaced by the metal implant, and resurfacing total hip replacement (often just called resurfacing hip replacement) where much of the femoral head is retained and a hollow metal cap is placed over it, while a matching metal cup (similar to that used with a conventional total hip replacement) is placed in the acetabulum. Resurfacing hip replacement surgery replaces the surfaces of the patient's hip joint and removes very little femoral bone compared to a conventional total hip replacement. It is important to note that resurfacing total hip replacements are of the MoM type in almost all cases. Whether used in conventional or resurfacing hip replacement procedures, MoM implants are used because the articulating (moving) surfaces of these implants can be precisely engineered to be extremely smooth and hard. MoM hip replacements are thought to provide advantages over metal on plastic hip replacements including lower wear rates and a lower incidence of dislocation. Dislocation is when the femoral head comes out of the acetabular cup and this is very painful and debilitating. In some cases further surgery is required to repair the hip joint. MoM components allow the design to accommodate larger head sizes, which in turn experience lower dislocation rates. A lower wear rate prolongs the life of the hip implant and delays the need for replacement (known as revision) surgery. According to data from the Australian National Joint Replacement Registry (NJRR) the use of MoM hip implants in Australia is declining. It is not possible to say precisely how many MoM hips have been implanted in patients in Australia. However, data from the NJRR covering the period 1999-2010 show that there were approximately 197,000 conventional total hip replacements in that period of which approximately 21,400 were MoM. In addition, a further approximately 14,000 were resurfacing (MoM) implants. The use of MoM implants is decreasing in Australia both in relative and absolute terms. What are the concerns with metal-on-metal implants? "Metal-on-metal Hip Implants - Information for Orthopaedic Surgeons Regarding Patient Management Following Surgery", Health Canada. 9 May 2012. Even though the physical wear rate of MoM hip implants is low, the body's natural joint lubricating fluid can react with metal ions or metal particles that may be produced around the implant. Where this occurs, the surrounding tissue can be affected leading to pain and inflammation and ultimately to the need for replacement of the implant. This type of local reaction can be a cause of premature failure of MoM hip implants. Furthermore, the extent of local soft tissue damage can increase over time increasing the risk of complications with revision surgery. There is also concern that chromium and cobalt ions from a wearing MoM implant can enter the blood stream and that this may lead to side effects in other areas of the body. There are a small number of individual case reports about health problems being experienced by patients with MoM Implants1, 2. These do not establish a definitive link between the use of metal-on-metal implants and the symptoms. Therefore there is insufficient evidence at this time to demonstrate that MoM hip implants produce side effects beyond those that may occur at the site of implantation. A study from the United Kingdom did not find an association between having a MoM hip joint and an increased risk of cancer.3 Work is underway internationally to determine if a link exists between MoM hip implants and systemic toxicity, and in particular what levels of cobalt and/or chromium in the blood are likely to be associated with any such effects. The TGA is actively monitoring international developments in this area. Implant design, its alignment during surgery and selecting the appropriate implant for the individual patient plays a large role in determining the ultimate outcome. Some MoM implants with large diameter femoral head components used in conventional total hip replacements have experienced relatively high rates of revision. Use of these large femoral head implants for total hip replacements is declining although they may still have advantages for some patients. Resurfacing surgery with small femoral head sizes has similar problems. Importantly, the revision rate of many MoM implants is currently comparable to other types of hip implants. The TGA monitors the performance of all hip implants by reviewing information provided by the NJRR and adverse event data collected by the TGA. Data on implants with higher than expected rates of revision surgery are referred to the Orthopaedic Expert Working Group for consideration. The OEWG is a panel of independent orthopaedic surgeons that was formed by the TGA in 2006 to provide expert advice to the TGA in relation to implants that experience higher than expected revision rates as identified through the NJRR. Since its establishment, the TGA has also sought the advice of the OEWG in relation to the specific issues associated with MoM hip implants. Smith A , Dieppe P, Porter M et al Risk of cancer in first seven years after metal-on-metal hip replacement compared with other bearings and general population: linkage study between the Nation Joint Replacement Registry of England and Wales and hospital episode statistics British Medical Journal 2012;344:e2383. Many MoM hip replacements had been performing as well as similar implants available in Australia. A blanket ban on all MoM hip implants would prevent some good implants from being used. Suboptimal performance was believed to be mainly associated with the use of larger femoral heads in conventional total hip replacement, and small femoral heads in the resurfacing hip replacement procedure. This emerging knowledge had changed surgical practice with surgeons better able to tailor the choice of implant to the needs of individual patients. The true incidence of complications due to metal sensitivity had not been established. An implant-by-implant review of performance data generated by the NJRR continued to be the most appropriate way to evaluate the relative performance of orthopaedic implants, including those that may have a MoM articulating surface. Both the AOA and the OEWG advised that all MoM hip implants should not be condemned solely on the basis that they are of the MoM type. In addition to increased post-market monitoring the TGA has also reclassified all hip, knee and shoulder prostheses from class IIb (medium risk) to class III (high risk) medical devices. From 1 July 2012 there is an increased level of pre-market assessment for any future devices of this type intended for the Australian market. All MoM hip implants being supplied in Australia will be re-assessed as part of their transition to the new class III requirements. What about cobalt and chromium levels in the blood of patients with MoM hip implants? Accelerated wear of the MoM implant leads to higher levels of cobalt and chromium in the blood. When the implant wears at an accelerated rate the patient will be likely to experience local symptoms such as hip or thigh pain. Sometimes these symptoms and other implant-related local problems can occur without elevation of cobalt or chromium levels in the patient's blood. At this point in time there is no accepted level of cobalt or chromium in the blood that is associated with adverse health impacts. Systemic toxicity arising from cobalt or chromium leaching from MoM hip implants has not been clearly demonstrated, but cannot be excluded. There is, however, concern among experts 5,6 that rising levels of metal ions in the blood (irrespective of the absolute levels found) after the first 18 months following insertion can indicate that the implant is deteriorating. Based on the available evidence routine follow-up including physical examination and X-rays should be performed on a regular basis for all patients with hip implants. For patients who have received MoM hip implants, follow-up should also include soft tissue imaging and monitoring for rising blood levels of cobalt and chromium. However, the TGA recognises that there are differing opinions about whether follow-up of patients with MoM hip implants should include regular blood testing for cobalt and chromium ions. Patients with elevated cobalt or chromium levels due to a failing hip implant will usually have symptoms such as leg and thigh pain. There is a report from one group4 suggesting that cobalt or chromium blood levels that are higher than 7 parts per billion (approximately 120 nmol/L for cobalt and 135 nmol/L for chromium) are an indication that a patient's MoM hip implant is beginning to fail and that there may eventually be some soft tissue damage around the joint if the MoM implant is not revised. However, there is some uncertainty about whether chromium and cobalt levels can be reproducibly and accurately determined at these sorts of levels. It should also be noted that cobalt and chromium ions typically rise in many patients in the first 12 to 18 months after the implant is inserted. This is known as the 'run in period' where there is polishing of tiny irregularities on the surface of the implant.8, 9 Also, metal ion levels, particularly cobalt, may be affected by changes in renal function, environmental or occupational exposure, consumption of dietary supplements containing these trace elements, and vigorous exercise. These factors need to be considered when interpreting cobalt and chromium levels. On balance, the TGA recommends that follow-up of patients include regular tests for cobalt and chromium in the blood, although the frequency of this testing will depend on the particular clinical circumstances of individual patients as well as other information provided by imaging. Further, in view of the current level of uncertainty around metal ion testing, the TGA recommends that rather than focussing clinical decisions on a single cobalt or chromium test result, surgeons consider whether the levels of these metals are rising as only one part of their decision-making about the need for revision surgery in light of the patient's symptoms, findings on clinical examination, and the results of imaging. Langton DJ et al Adverse reaction to metal debris following hip resurfacing J Bone Joint Surg 2011;93-B:164-71. Consider revision if there are persistent symptoms, particularly where there are cross-sectional imaging abnormalities and/or where the levels of cobalt or chromium in the blood are progressively rising. Follow-up: if the patient has a total conventional hip replacement with a femoral head that is 36 mm in diameter or larger; or if the patient has a resurfacing hip replacement with a femoral head that is 45 mm in diameter or smaller; there should be annual follow-up for the life of the implant. Otherwise, the frequency of follow up should be in accordance with standard practice for patients with other (non-MoM) hip implants. Blood tests: Cobalt and chromium levels. Regular monitoring will allow an assessment to be made as to whether levels of these metal ions are increasing over time, which may be an indicator of implant wear and potential failure even in the absence of symptoms. Consider revision if there are cross-sectional imaging abnormalities and/or where the levels of cobalt or chromium in the blood are progressively rising. I am kind a flabergasted at the lack of recommended follow up in the US vs other countries who have much more experience with the probblem.